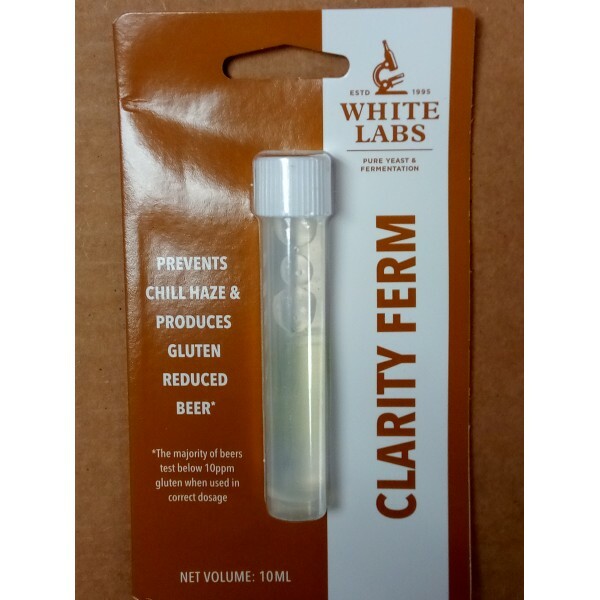 Clarity Ferm, also known as Brewer's Clarex, is an enzyme that is effective in preventing chill Haze. 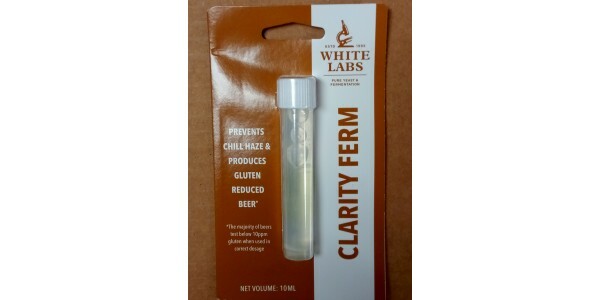 Not only will this enzyme improve beer clarity, it will reduce gluten below the international level to be considered as being "free of gluten." It also helps increase shelf life and product consistency. There is no impact on beer flavor or aroma, and seemingly no effect on head retention. Although experimentation has shown that head retention is slightly improved when using this product. It is also capable and primarily used by homebrewers for producing gluten reduced beers made from barley. The majority of beers test below 10 parts per million gluten, which is below the international standard of 20 ppm, when used in the correct dosage. Dosage: add one 10 ml vial to 5 to 7 gallon fermenter of cool wort at the same time as pitching your yeast.